Poignant and picaresque are the tales of Charles Dickens with characters that may be considered idealized as they struggle in a world of social stratification and disparity. With the passing of Christmas many have been reminded of (and may be ready to forget) one of Dickens’s most popular works A Christmas Carol with its humbugging main character Ebenezer Scrooge who experiences a miraculous change of heart by the end. Just last month DJABC featured Fitzwilliam Ebenezer Darcy by Barbara Tiller Cole, which takes Jane Austen’s Mr. Darcy on a Dickensesque night of ghostly (and angelic) visits to bring about his redemption. As Dickens mixed realism with a good dose of fantasy to weave his satirical social commentaries of Victorian society how much more fantastical can a tale such as Great Expectations become? Well, Sherri Browning Erwin answers this question with her monster mashup Grave Expectations adding another elemental layer of darkness. With the addition of werewolves, zombies, and the supernatural, this month’s book choice promises to bite back. Having read Sherri Browning Erwin’s Jane Slayre as our May 2012 selection we are already acquainted with her skill of bringing the monster horde to the literary world of Charlotte Bronte, so it is with great anticipation that we pick up our copies of Grave Expectations to experience the invasion once again of the monster horde. Will Dickens hold up? He himself had included the presence of ghosts within his own writing. What’s a little more twisting of reality? Erwin will be joining us to guest post and interview this month. 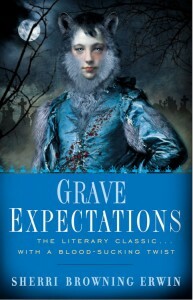 We will also be running a giveaway of not one, but two autographed copies of Grave Expectations for our readers in the continental U.S. Be sure to follow us on Twitter, Facebook, or subscribe to DJABC so you don’t miss a thing. And join us for discussions via post comments and in out Discussions forum. Did you read Jane Slayre with us? Are you looking forward to Grave Expectations? What is your favorite monster?